NODDFA Harlech, self catering cottages with instant confirmed online booking. We have Self Catering throughout Gwynedd , Wales . Accommodation near all the attractions, places to see and things to do.......You are able to make an instant secure confirmed online booking. 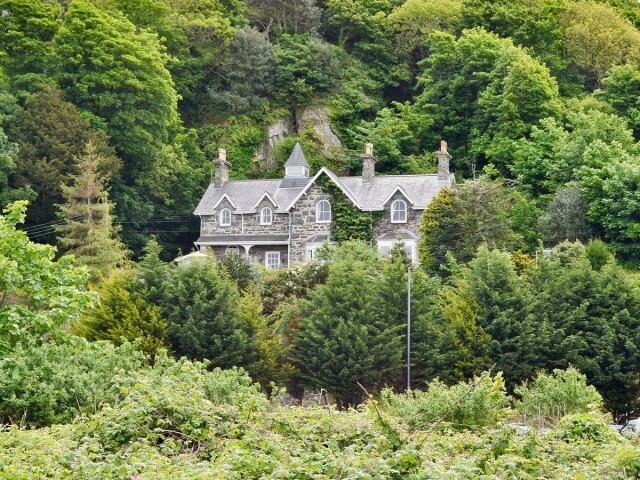 We also offer Gwynedd AND Wales travel and tourist information..
A large detached mansion with open fire and cinema room. Ideal for large gatherings and special occasions. Wonderful views towards the coastline.. Situated between Harlech Castle, a UNESCO World Heritage Site, and the world class Royal St Davids links golf course, Noddfa has beautiful views of both and the sea beyond. The current detached mansion has a history dating back 250 years, and was protected by the castle garrison. However the distinctive frontage of the house was added in 1850 by Samuel Holland MP and retains much of the Victorian character and splendour, with high ornate ceilings and a bell tower. The fully refurbished holiday accommodation comprises entrance hall, dining room with table for 20, a large drawing room with views over the links, cinema room, large farmhouse kitchen and cloakroom. On the first floor there are five double bedrooms, two twin bedrooms and one bunk, all of which are en-suite. Charming gardens surround the property with ample parking. Harlech is an attractive town with a theatre, a magnificent sandy beach with bathing and good restaurants and shops. Portmerion, Ffestiniog railway and Snowdon are all within a short drive. Golf can also be found nearby. Shops &frac12; mile, pub 300 yards.. Ground Floor:Drawing room: With TV, DVD player and stereo/CD.Snug: With open fire.Dining room.Kitchen: With gas range (electric oven for cooking), microwave, 2 dishwashers, washing machine, tumble dryer, fridge/freezer and slate floor.Cinema room.Cloakroom.Separate toilet.First Floor:Bedroom 1: With zip and link twin beds and en-suite with shower cubicle and toilet.Bedroom 2: With double bed and en-suite with shower cubicle and toilet.Bedroom 3: With double bed, single bed and en-suite with bath, shower attachment and toilet.Bedroom 4: With double bed, single bed and en-suite with bath, shower attachment and toilet.Bedroom 5: With double bed and en-suite with bath, shower attachment and toilet.Bedroom 6: With zip and link twin beds and en-suite with shower cubicle and toilet.Bedroom 7: With double bed, twin beds, low beams and en-suite with corner bath, shower attachment and toilet.Bedroom 8: With bunk bed and en-suite with shower cubicle and toilet.. Oil central heating, electricity, bed linen, towels and Wi-Fi included. Fuel for open fire available locally. 2 cots. Highchair. Welcome pack. Rock sloping garden and barbecue. Parking for 10-12 cars. Catering available by prior arrangement with owner. No smoking. Please note: There is an unprotected drop in the garden. Situated between Harlech Castle, a UNESCO World Heritage Site, and the world class Royal St Davids links golf course, Noddfa has beautiful views of both and the sea beyond. The current detached mansion has a history dating back 250 years, and was protected by the castle garrison. However the distinctive frontage of the house was added in 1850 by Samuel Holland MP and retains much of the Victorian character and splendour, with high ornate ceilings and a bell tower. The fully refurbished holiday accommodation comprises entrance hall, dining room with table for 20, a large drawing room with views over the links, cinema room, large farmhouse kitchen and cloakroom. On the first floor there are five double bedrooms, two twin bedrooms and one bunk, all of which are en-suite. Charming gardens surround the property with ample parking. Harlech is an attractive town with a theatre, a magnificent sandy beach with bathing and good restaurants and shops. Portmerion, Ffestiniog railway and Snowdon are all within a short drive. Golf can also be found nearby. Shops ½ mile, pub 300 yards.